We offer gorgeous handcrafted flower arrangements between $40 and $50 dollars. 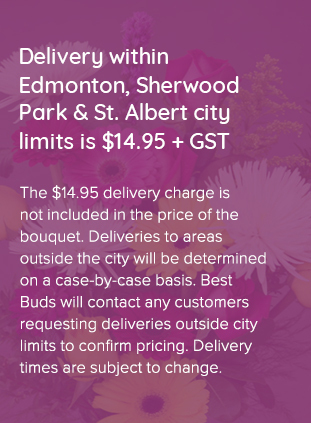 All these arrangements are made in our Edmonton store with the best hand picked flowers. Gorgeous assortment of fresh springy tulips in a mason jar or a glass vase. Just let us know in the special notes! This sweet little crown would be great for a birthday party, a photo shoot or any special occasion. Made to order and can customize colours and flowers. ***Prices may vary for specific flowers. A lovely spring arrangement to enjoy any day. Or you can also welcome a new baby with a little touch of rustic blues. Hand-painted mason jars bring a little extra special touch! Full bunch of local B.C. Flowers. Fits well into a medium sized vase at home. Always in season! Some fun and fresh colours with some great contrast. Do you have a cabinet full of vases? This bunch will fit nicely into most vases you have at home. All you have to do is trim the stems before you stick them into clean water! Go for monochromatic gold with this single colour arrangement. A bouquet can be made with a couple of different colours to compliment each other. Can be custom ordered to fit your colour needs. A tasteful design of some modern flowers with a fall theme. Dendrobium orchids in a vase with rolled over tropical leaves and filler.